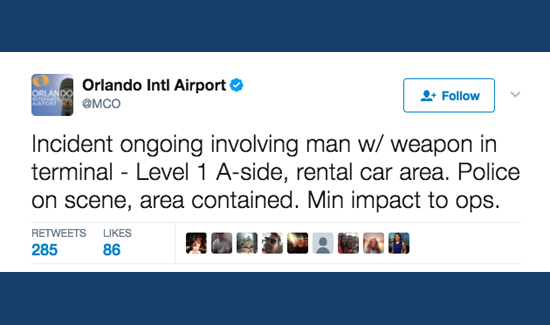 A sharp clap rang through the east end of Orlando International Airport’s sprawling terminal on Tuesday, unnerving travelers who thought it was a gunshot. They were right. A federal agent had accidentally shot himself in the left foot, having somehow dislodged his holstered pistol and pulling the trigger while grasping for the weapon. It happened on the busy ticketing and departure floor in the multistory atrium at the Hyatt Regency, the noise sounding like a large board falling on tile flooring. The agent, wearing a vest and T-shirt depicting an American flag and the word “PROUD,” and the overall scene remained calm for several minutes. It was hard to say what had just happened. “I know that was a gunshot,” said a woman standing at an information kiosk. Another said she was still shaking from the noise. Several Transportation Security Administration officers stepped out from their screening stations, then two Orlando police officers arrived. They calmly approached and then questioned the man who would later be treated for a gunshot. He did not appear to be in distress, but the scene began to draw attention from throngs of passengers and airport workers. At 40 minutes before noon, the crowd passing through the nearby security check was lighter than earlier in the morning. Ultimately, a mass of law enforcement converged, including an Orlando police officer on a bike and another in plain clothes, and Homeland Security officers. Police there said the man, with a shaved head and gray goatee, was an Immigration and Customs Enforcement agent from Kansas City on vacation.